Vancouver, BC - Skyharbour Resources Ltd. (TSX-V: SYH) (OTC Grey: SYHBF) (Frankfurt: SC1N) (“Skyharbour” or the “Company”) is pleased to announce it has entered into a Purchase Agreement (the “Agreement”) with Denison Mines Corp. (TSX: DML) (“Denison”) whereby Skyharbour will acquire Denison’s 100% interests in the 90,892 hectare Way Lake Uranium Project as well as the 12,660 hectare Yurchison Lake Project both located on the eastern flank of the Athabasca Basin, Saskatchewan. Under the terms of the Agreement, Skyharbour will pay $20,000 in cash and issue two million common shares in consideration for Denison’s 100% interest in both projects. The common shares of Skyharbour are issuable upon TSX Venture approval and will be subject to a hold period of four months and one day from the date of issue. Denison will retain a 2% NSR in the projects of which 1% may be purchased by the Company for $1,000,000. The Way Lake Uranium Project is comprised of 21 contiguous claims totaling 90,892 hectares located 55 kilometres east of the Key Lake mine in northern Saskatchewan. Uranium mineralization discovered to date at Way Lake is shallow and is hosted in two geological settings with the northern half of the property characterized by structurally controlled uranium mineralization (Hook Lake, West Way and Nob Hill zones), whereas the southern half hosts classic Athabasca-style basement mineralization associated with well-developed EM conductors (EWA, Walker and Fraser Lakes zones). Drilling to date on the Way Lake Project totals over 20,000 metres in 105 holes. Over $10 million has been invested in exploration consisting of airborne and ground geophysics, multi-phased diamond drill campaigns, detailed geochemical sampling and surveys, and ground-based prospecting culminating in an extensive geological database for the project area. Discovered in 2008, Zone B is located within the broader 6 kilometre by 7 kilometre Fraser Lakes target area where multiple mineralized zones have been discovered along a 65 kilometre long, folded EM conductor system comprised of Wollaston Group graphitic pelitic gneisses and uraniferous granitic pegmatites. Diamond drilling consisting of 25 holes totaling 4,603 metres has defined a zone of moderately dipping, multiple-stacked uranium and thorium mineralized horizons down to 175 metres that is open to the southwest and east-northeast as well as at depth. The style of uranium mineralization associated with intrusive rocks is commonly referred to as “Rössing type” mineralization named after the largest, longest-running open pit uranium mine in the world, the Rössing Mine operated by Rio Tinto in Namibia. JNR Resources Inc., a company acquired by Denison in 2013, announced an initial mineral resource estimate in 2012 for the Fraser Lakes Zone B of 6,960,681 pounds U3O8 inferred at an average grade of 0.03% U3O8 and 5,339,219 pounds ThO2 inferred at an average grade of 0.023% ThO2 within 10,354,926 tonnes using a cutoff grade of 0.01% U3O8. The independent NI 43-101 technical report supporting this mineral resource estimate was filed on SEDAR on September 26, 2012 by JNR Resources. Independent qualified persons, Dr. Allan Armitage, P.Geo., and Alan Sexton, M.Sc., P.Geo., of GeoVector Management Inc., are responsible for the contents of the technical report and comments related to the resource estimate and its parameters. 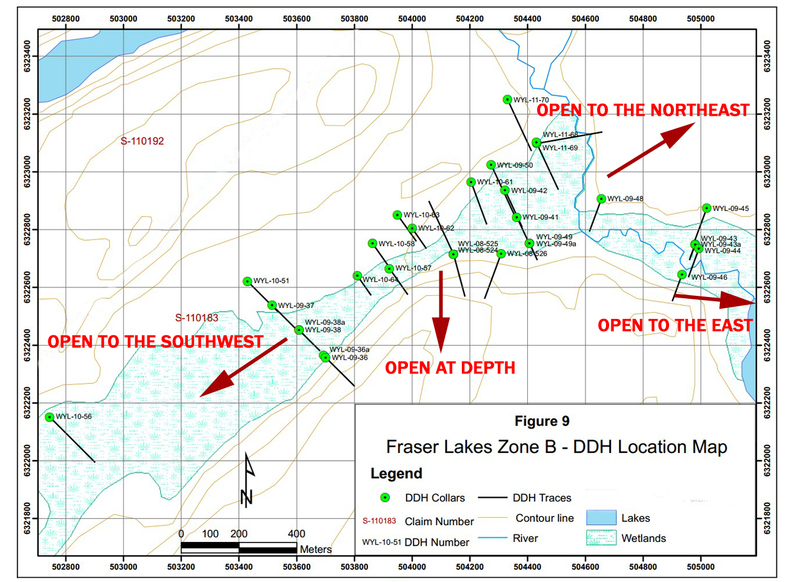 The exploration potential of the Fraser Lakes target area is considered exceptional, including the resource expansion potential of the current deposit at Zone B. Geological and geochemical features show distinct similarities to high-grade, basement-hosted deposits in the Athabasca Basin such as Eagle Point, Millennium, P-Patch and Roughrider. 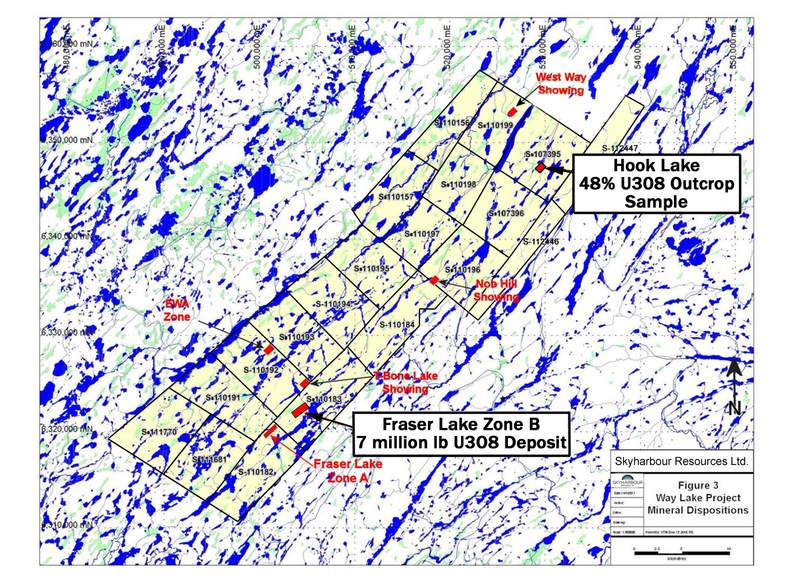 On the northern side of the Way Lake property at the Hook Lake target, high grade uranium mineralization has been discovered with up to 48% U3O8 in historic grab samples. The massive pitchblende vein containing the high grade uranium mineralization is hosted in basement intrusive rocks exposed at surface. The mineralization has similarities to the Eagle Point uranium deposit being structurally-controlled, vein-type, high grade, and likely part of the feeder system to more typical high grade, unconformity uranium deposits. Previous operators have been unable to definitively explain and locate the source of the high grade uranium in the massive pitchblende vein that assayed up to 48% U3O8. At the EWA target located on the southern portion of the Way Lake property, up to 0.492% U3O8 and 1,300 ppm lead were obtained from grab samples. Eight holes drilled in 2008 intersected variably radioactive granitic pegmatite dykes including an intercept of 0.082% U3O8 over 6.5 metres. The Nob Hill target in the central part of the property hosts vein-type uranium mineralization and includes a drill intercept of 0.018% U3O8 over 5.0 metres. The Walker Lake, Walker South and Walker River showings occur along a conductive trend that covers some 60 kilometres of structurally displaced EM conductors in the southwest portion of the property. Historic reconnaissance drilling has intersected strongly clay and/or chlorite altered, sheared and faulted graphitic pelites containing anomalous uranium, copper, nickel, zinc and molybdenum. The West Way target at the northern end of the property consists of vein-hosted uranium mineralization and includes grab samples that returned up to 0.492% U3O8. The 12,660 hectare Yurchison Lake property consisting of four claim blocks is located 70 kilometres southeast of the McArthur River uranium mine. Previous prospecting and geological mapping in and near old trenches returned significant uranium (0.09% to 0.30% U3O8) and molybdenum (2,500 ppm to 6,400 ppm) mineralization in both outcrop and float samples. In 2008, two holes drilled beneath the historic trenches returned highly anomalous molybdenum values of up to 3,750 ppm and anomalous uranium values of up to 240 ppm. The property boasts strong discovery potential for both basement hosted uranium mineralization as well as copper, zinc and molybdenum mineralization. Skyharbour also announces that it will make an application with the TSX Venture Exchange to extend the exercise period of a total of 1,800,000 non-transferable share purchase warrants (the "Warrants") for a further two year term. The Warrants are comprised of 1,800,000 Warrants issued in connection with a 2,000,000 unit non flow-through private placement, with closing announced on June 29, 2011. The 1,800,000 Warrants are currently exercisable at a price of $0.125 per warrant share until June 24, 2014. Upon receipt of TSX Venture Exchange acceptance, the 1,800,000 Warrants will expire after the close of business on June 24, 2016. Skyharbour Resources Ltd. is a uranium exploration company and a member of the Western Athabasca Syndicate which controls a large, geologically prospective land package consisting of five properties (287,130 hectares or 709,513 acres) in the Athabasca Basin of Saskatchewan. $6,000,000 in combined exploration expenditures over the next two years is planned on these properties, $5,000,000 of which is being funded by the three partner companies. 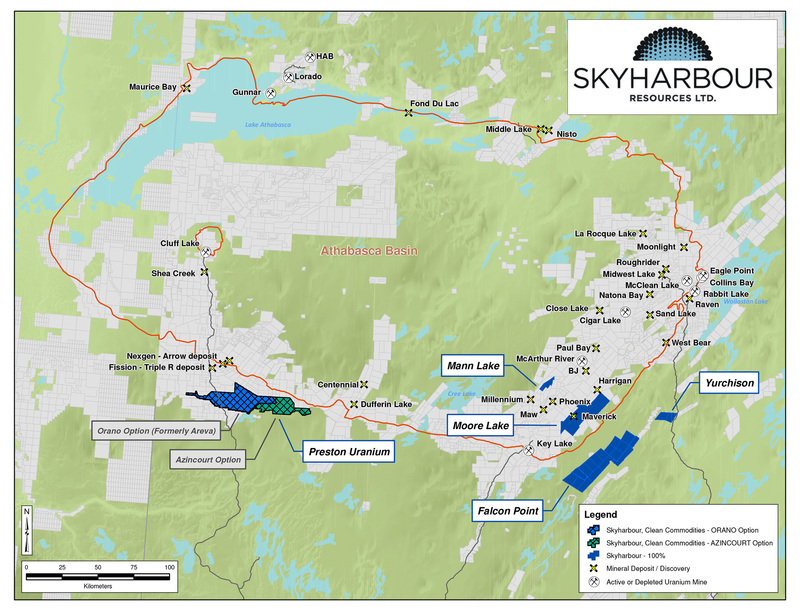 Skyharbour also owns a 60% interest in the Mann Lake Uranium project on the east side of the Basin strategically located 25 km southwest of Cameco’s McArthur River Mine. The Company has 55 million shares outstanding with insiders owning over 20% of the outstanding shares. 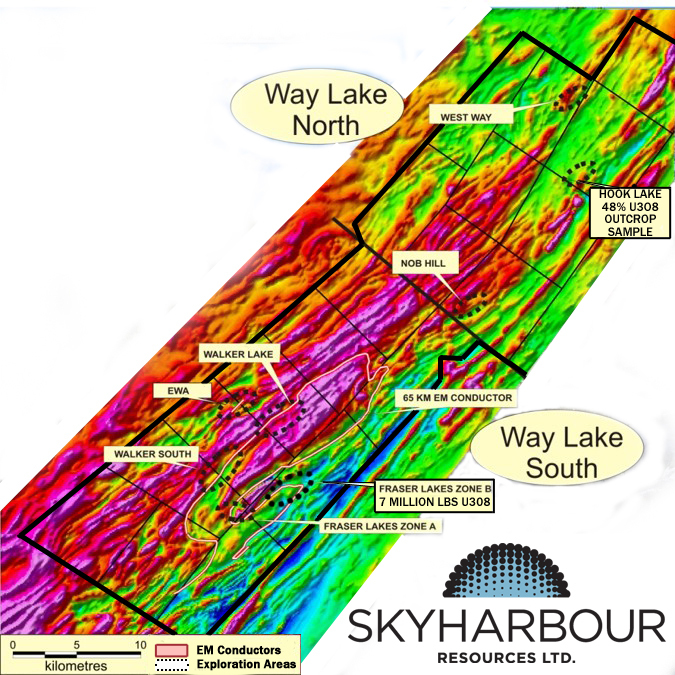 Skyharbour’s goal is to maximize shareholder value through new mineral discoveries, committed long-term partnerships, and the advancement of exploration projects in geopolitically favourable jurisdictions.